Videos and interviews that describe our company and our products through images. A new technology which permits to print HD quality photos and graphics on Guardini bakeware moulds. Thanks to this technology it is possible to print with 4 colour process + 2 pantone colours decorations resistant to oven temperature and washing. It is then a new promotional possibility, particurarly suitable for licensing and customized project. The decoration process will be entirely arranged in our factory, granting flexibilty and fast response to customers’ needs. 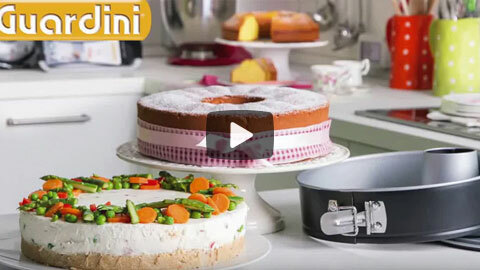 Guardini, a real bakeware specialist, is a company in constant growth and development, committed since its foundation to a continuous quest for innovation. In a constantly changing market, Guardini is always attentive to the tastes of those who buy and to the needs of those who sell, providing to the consumers the best solutions to express themselves in cooking and to the trade the most effective commercial tools. Guardini is imagination, creativity, technology, innovation and, above all, quality. Quality materials and competitive prices, in an infinite variety of shapes and colours. 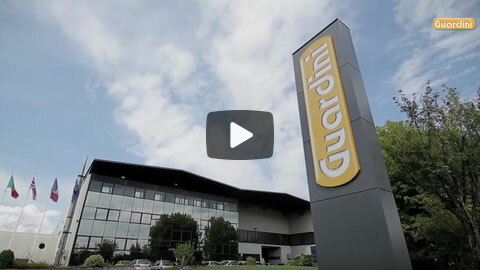 For 70 years Guardini has been a leader in the production of bakeware products; we are based in Volpiano (TO) and our brand is world known; our history tells a story of passion, craftsmanship which translates into production ability, creative work, continuous research and experimentation. 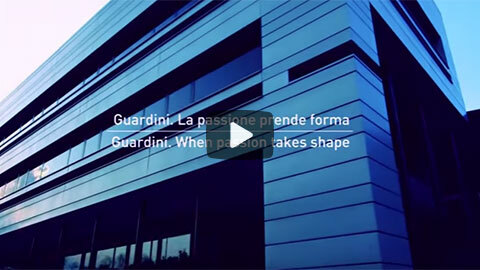 Guardini, when passion takes shape! 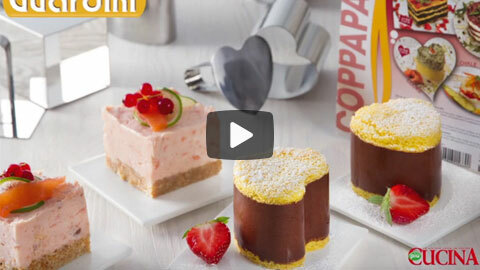 Guardini, a real bakeware specialist, is also imagination, creativity, technology, innovation and, above all, quality. In an infinite variety of shapes and colours. The GUARDINI ROASTING SET represents new and innovative concept: perfect for roasting and cooking in the oven. The box contains: 1 non-stick baking sheet, 1 steel grill, 1 non-stick roast pan. The two non-stick baking moulds are tested for use in the oven up to a maximum temperature of 230 °C. They are able to ensure exceptional performance of non-stick, duration and cooking. The special form (provided with studs) with the lid and the grid promote the right and uniform circulation of air inside the roaster and the drain of the roasting liquid. Thanks to this, cooking excess fats slip and this support an healthy cooking. The two roasters can also be used separately for cooking sweet and savory food. 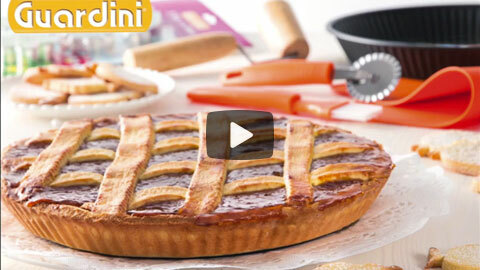 The Guardini loose base flan tin is ideal for baking the tart, made with jam or fresh fruit. The loose base flan tin, with a special removable bottom allows a perfect baking and a perfect flan release, avoiding breakage of a so delicate dessert. Bake Away: Bake, close, and take away! Bake Away is a range of moulds equipped with a convenient carrying lid, which allows you to carry anywhere all your preparations, cooked or to be cooked. The moulds are made of Hi-Top steel with one coat of non-stick coating, that ensure perfect non-sticking results of sweet and savoury recipes. The plastic cover is made of plastic and it should be used for transport and storage in the refrigerator (do not use it in the oven). It is equipped with two handles that permits an easy hold. 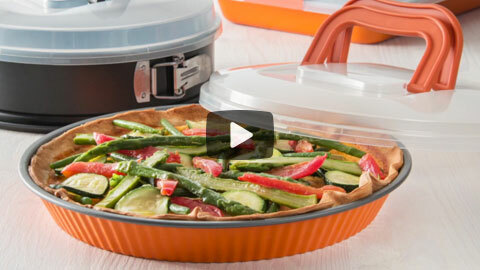 Bake away line is perfect to transport dishes to cook or already cooked, in the mould itself. 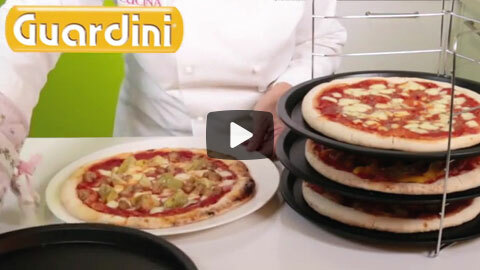 The Guardini steel grill rack is ideal for baking at the same time up to 5 pizzas! Guardini presents a complete range of food rings. These utensils are ideals for cutting the dough in several shapes, create desserts or to serve rice, vegetables pies, tartar in an original, elegant and refined way. This tray can be stretched from 36 up to 56,5 of length. The trays are made of Hi-Top steel with one coat of non-stick coating, that ensure perfect non-sticking results of sweet and savoury recipes. 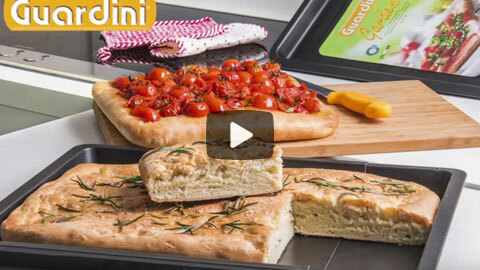 Ideal to bake pizzas or biscuits, perfect for multiple uses! Springform 2 bases…the perfect tool for bakeware! The springform cake tin is Guardini’s best seller. 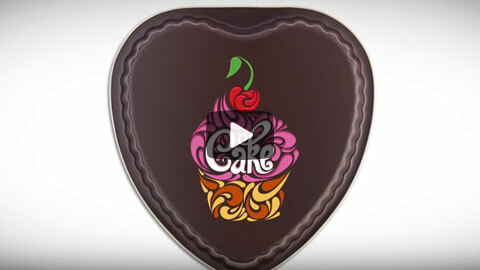 Thanks to the buckle it allows the release of your cakes without damage or breakage. And from now, it has an extra touch of functionality and refinement: the special leak-proof base avoids any leaking of mixture from the mould, keeping the oven and cooking shelf perfectly clean. The springform cake tins with leak-proof base will be present in the greater part of the Guardini collections and are available in different colours and different non-stick coatings.